Dress up your batons and equipment with these handy bulk rolls of 3-dimensional PRISM FOIL, and PLAIN FOIL. 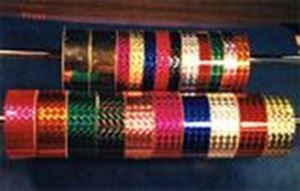 You can create all kinds of patterns and designs on your batons, flagpoles, rifles, etc...Each roll is 25' by 1" or 1/2" wide. 3-D COLORS: Red, Gold, Silver, Green, Orange, Royal, Pink, Purple, Hot Pink, Black, Grape, Light Blue, Neon Green.